Description: This is a portrait of Edward Snowden the former CIA employee and government contractor who leaked classified information from the U.S. National Security Agency (NSA) in 2013. 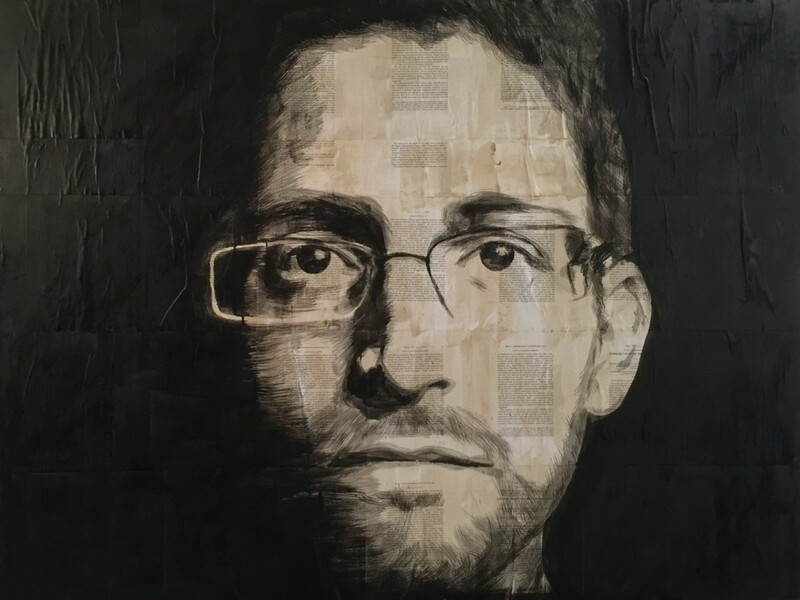 A subject of much controversy, Snowden has been variously called a traitor, a hero, a dissident, a patriot, and a whistleblower. The piece is done on pages from litigation naming Snowden as a defendant. Did you have permission to use and display on the internet any copyrighted materials in your artwork from the attorney author(s) of those litigation papers? Please reply promptly after reviewing this: https://www.dmca.com/FAQ/What-is-a-DMCA-Takedown. I’m no attorney, but all of the documents that I use as backgrounds in my artwork have been published and it is my understanding that the federal court rulings and state supreme court rulings that I paint on are public domain materials. I have no intention of infringing on copyrighted material. I merely mean to to comment on, parody, satire, and lampoon the content. Should you feel it is necessary to initiate a DMCA taked down, I certainly cannot stop you. But I would respectfully ask that you evaluate my work as a whole and reconsider. Further, I should clarify. I find the work of the attorneys and the subject matter noteworthy. So much so that they inspire the unconventional artwork on this portfolio. I mean no disrespect.